There's been some talk about naming your beads and jewelry for online sales. Some are strictly referring to search key words, saying it's not neccesary to name them. I think a name can sell a product also. 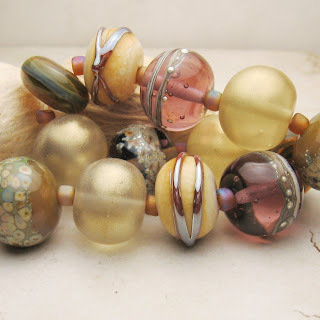 Imagine a set of beads listed as Lampwork glass beads, Pink, gold, green, set of 12. Or...Set of 12, Handmade lampwork glass beads in pink champagne, iridescent golden shimmer and olive green 'Autumn Dawn' Which would make you want to purchase this set? (assuming the pictures are top notch) Names and descriptions can help sell your jewelry and beads. People love to be romanced and since online shopping is strickly visual, the right name and description is very important. This set sold the day after it was listed.